New Mexico’s majestic mountains boast some of the most sublime untamed settings. Taking a walk on the wild side, I found that in our enchanted forests you can go green without spending it. This month, with mountaintop snow beginning to melt and spring on the way, edible wild dandelion (Taraxacum officinale) and stinging nettles (Urtica dioica) will soon be abundant—and these leafy greens are free. Bona-fide wildcrafters—those who forage for nature’s seasonal bounty—enjoy a taste of adventure in finding uncultivated foods. It’s vital that the beginning forager learn from an experienced teacher how to properly identify and harvest wild foods. Having sound wilderness skills, respecting private property, and foraging in safe environments are also prerequisites for such journeys. “Dandelion greens are probably the least difficult wild greens to recognize, but, as with any wild plants, have a knowledgeable person introduce them to you,” says John Duncan, an expert in wild foods and medicinal plants who teaches at the University of New Mexico’s Taos campus. Wild-food advocates hail this herb, which is usually snubbed as a lawn nuisance. When Duncan guides field trips in the Sangre de Cristo Mountains outside Santa Fe and Taos, he finds that dandelions are prolific even in the high mountains. “It’s important that wild plants are picked in an area where there is no use of herbicides, or pollutants from industry or automobiles,” he says. Duncan’s bioregion boasts numerous microclimates, and greens first appear in different areas at different times. In general, foraging begins around April in the Sangre de Cristos, or earlier in spring at lower elevations. Duncan, who lives in the Taos area, where he guides weekly plant-identification walks in June, grew up eating weeds. His mother was from Italy, and each spring she fed the family salads of wild dandelion. Topped with sliced hard-boiled eggs, olive oil, and vinegar, these childhood salads are something he cherishes to this day. I, too, relish the earthiness of these raw, tender leaves tossed into pleasing gourmet salads, and their flavor akin to endive and chicory, with a bitter hint of bite. A tip: Pick young leaves before the plant blooms, to neutralize the greens’ natural bitterness. Duncan says that the sun-colored dandelion flowers, minus their small green bracts, are also great in salads, to which they add flairs of color and subtle flavor. Besides, each forkful of dandelion offers a mouthful of health. 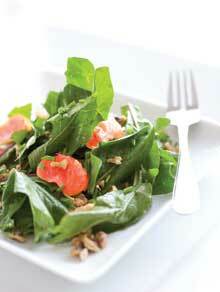 “Raw dandelion greens are high in vitamins and minerals like vitamin C, calcium, and iron,” says Duncan. Not into wild and free? Browse the stalls of your local farmers’ market, or buy the milder grocery variety of dandelion greens at supermarkets, natural foods stores, and cooperatives. In northern and central New Mexico, La Montañita Co-op Natural Foods Market (with locations in Albuquerque, Santa Fe, and Gallup) can special-order dandelion greens year-round. In southwestern New Mexico, the Silver City Food Co-op regularly carries the Catalogna variety of dandelion, and stocks locally grown dandelions in season. In the high-desert Southwest, stinging nettles usually begin to poke up out of rich mountain soil from March through June, rising to a warming sun, and usually again in fall. Armed with a basket, a sturdy pair of leather gloves, and a pair of pruners and/or gardening shears, Kiva Rose harvests nettles around mid-morning. “When I harvest stinging nettles, I usually clip the top half or third of the plant, being sure to leave at least one set of leaves so the plant can grow back.” Rose prefers to harvest young, tender plants with less stem and bigger, more abundant leaves. Then, with gloved hands, she gently washes the nettles in cool water to rinse away debris. If she’s going to store the nettles, Rose blanches the greens before freezing them. Boiling or steaming nettles dissolves the stingers and their formic acid. Steamed, nettles taste much like spinach, and are a nutritional powerhouse, providing protein, iron, potassium, manganese, and vitamins A and C. Rose showcases nettles’ culinary charm in her extra-special Enchanted Forest Stinging Nettle Stew, which casts a delicious spell of Southwestern flavor. Although nettles are wild greens, you might find a big bunch at your local growers’ market or from a private grower. Some courageous gardeners plant stinging nettles at home. Why forage? “Not only are many wild greens more nutrient-dense, thanks to the health of most wild soil, but they also offer a cheap, usually free, and potentially sustainable way of obtaining tasty and nutritious food,” Kiva Rose observes. Foraging knowledgably, with respect for the plants and observing careful harvesting practices, can result in a deep-rooted love for the natural foods of our enchanted land. Deming-based freelance writer and nutritional expert Wendy Sue Gist writes about healing foods and wellness. “This is a great early-spring dish when the evenings are still cool, but the greens are popping up everywhere,” says Kiva Rose. Brown chicken on bone in frying pan. Transfer to 1-gallon stew pot, add mushrooms, and cover with water. Simmer together 2 hours; as it cooks down, add more water as needed. 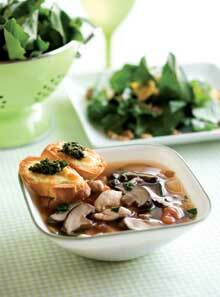 Remove mushrooms and chicken and set aside; save broth. Slice mushrooms and debone chicken. (see below) and serve as main course. Created by wild foodie Kiva Rose. For more info about Rose’s spring workshops in wild foods: www.animacenter.org. “Spring is not only a time to begin foraging for wild greens, but a time when blood oranges come into season,” says chef Shevek Barnhart, co-owner of Shevek & Co. Restaurant. Put all ingredients below in blender and blend on high for 90 seconds. 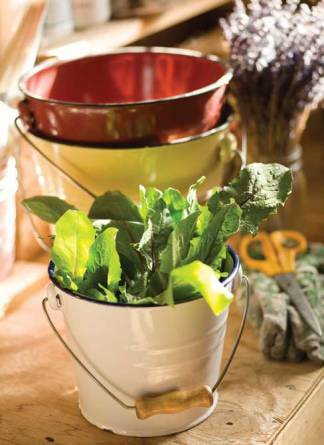 Soak dandelion greens 5 minutes in cold water with 1 tablespoon salt to kill any bugs. Drain, then rinse with cold water. Drain or spin greens dry. Place in salad bowl. On cookie sheet, bake walnuts in oven 5–6 minutes, or until lightly browned. Let cool 5 minutes. Add cooled nuts, orange pieces, and chopped scallions to bowl of greens. Dress with desired amount of dressing 5 minutes before serving. Created by chef Shevek Barnhart. For info about Shevek & Co. Restaurant: www.silver-eats.com. Recipes printed and posted online with permission.